I like to keep things pretty relaxed during the summer, but I also like to provide plenty of hands-on learning experiences for my kids at home and out around town. We are getting ready for summer, so I've been thinking about a variety of different ways that we can learn and explore while being active outdoors. 1. Do simple backyard science experiments. Backyard science activities don't have to be hard and exploring doesn't mean you have to leave your neighborhood. Our favorite activities are baking soda volcanoes, milky color explosions, and ramp drip painting. We also made a bouncy ball with borax recently and we will need to do that again. It was awesome. Buy vinegar and baking soda in bulk and you could fill up hours of time doing experiments or just doing fizzle painting. 2. Participate in lots of water play. You can explore using water in a lot of ways! Making a car wash, doing chalk painting, spraying the car, doing ice painting, or putting out the fire with a hose are just a few of our favorites. Water painting is awesome too. We love anything that keeps us wet and cool during the hot weather and also sneaks in a little learning while we are having a whole lot of fun! 3. Put together some recycled materials challenges. Tinkerlab is my favorite site for inspiration. We've made hockey sticks from magazines, paper bag books from paper bags, and pour paint rockets from bottles. Just look at the recycled materials you have and and challenge your kids to create something. You will be amazed by their creativity. 4. Attend local summer camps and do some related extension activities. We are headed to Camp Galileo. If you live in the San Francisco Bay area, you'll want to check out Galileo Camps. They have awesome weekly themes and create an environment of exploration and innovation. My son is counting down the days to go to the Space Odyssey themed week. After camp we plan to do fun learning activities that tie in with the space theme. If Camp Galileo isn't near you, find another awesome day camp and use it! Don't let the camp counselors have all the fun... make sure to join in the creativity by extending the summer camp excitement into your evening activities! 5. Check out local science museums, zoos, and nature preserves. One favorite thing to do in the summer is find free or inexpensive parks or nature preserves to visit. We've gone on color hunts and bug hunts while we roam around. Zoos and local science museums can be great too and you can often find dramatically discounted prices. 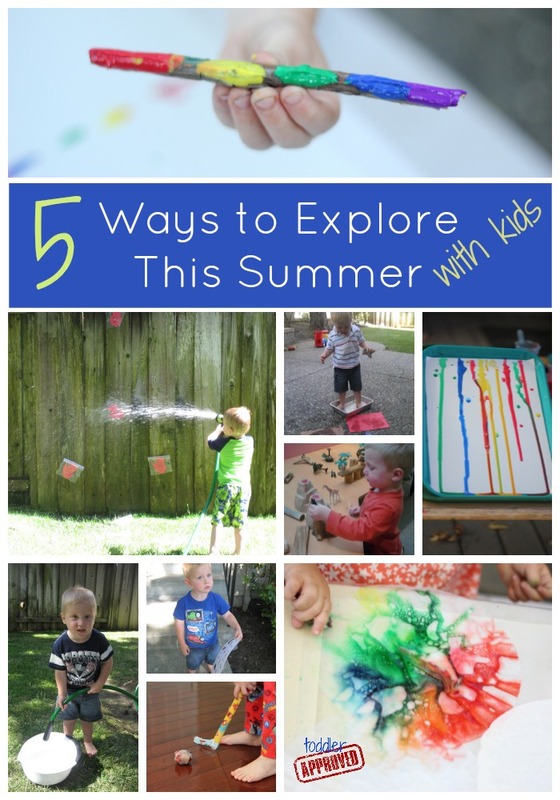 We could probably do just these activities all summer long, again and again, and my kids would be incredibly happy. How do you plan to explore with your kids this summer? Come share your ideas in the comments! These are great ideas! I love that picture of your son making footprints on paper with water. That is brilliant. I am definitely doing that with my kids this summer. Great ideas! Thanks for the simple list and links.